Colonel Patrick West is Tuesday scheduled to be sworn in as the 10th Chief of Staff of the Guyana Defence Force (GDF), three months after Brigadier George Lewis took over the helm of the army. Lewis has reached retirement age. 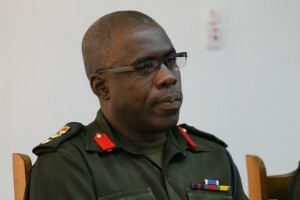 West, who currently heads the resuscitated Guyana People’s Militia (GPM), retires from the army in another four years. West will be promoted and sworn in on Tuesday at 7:30 Tuesday morning at the GDF Officers’ Mess, Camp Ayanganna by Commander-in-Chief, President David Granger. A Change-of-Command Parade is scheduled for later in the day. Lewis on October 4, 2016 was promoted to Brigadier and succeeded Brigadier Mark Phillips.